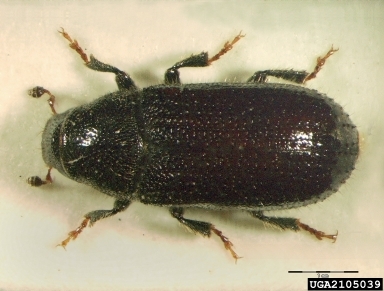 The pine shoot beetle (Tomicus piniperda) is a pest of pine trees. While larval damage is insignificant, newly emerged adults fly to and burrow in new lateral pine shoots, feeding and causing significant damage. Surveys are conducted because of the presence of potential host material in Wyoming and potential for significant harm to pine. It has been found in the US. To date, it has not been found in Wyoming. One hundred three total traps have been placed throughout twenty-three counties in Wyoming. The pine shoot beetle survey is conducted by the Animal and Plant Health Inspection Service, Plant Protection and Quarantine. A Lindgren funnel trap with host attractant is placed on or near the host plant from May until September. If suspects are found they are sent to a state entomologist for further identification.